1Department of Geoscience, HiPSEC, UNLV, USA. 2Division of Geology and Planetary Science, California Institute of Technology, USA. 3GSECARS, University of Chicago and Advanced Photon Source, USA. Meteorites exposed to high pressures and temperatures during impact-induced shock often contain minerals whose occurrence and stability normally confine them to the deeper portions of the Earth’s mantle. One exception has been MgSiO3 in the perovskite structure, which is the most abundant solid phase in the Earth. Herein is the first report on this important phase as a mineral discovered in the Tenham L6 chondrite and approved by the International Mineralogical Association (IMA 2014-017). MgSiO3-perovskite is now called bridgmanite. The associated phase assemblage constraints peak shock conditions to ~ 24 GPa and 2300 K. The discovery concludes a half century of efforts to find, identify, and characterize a natural specimen of this important mineral. 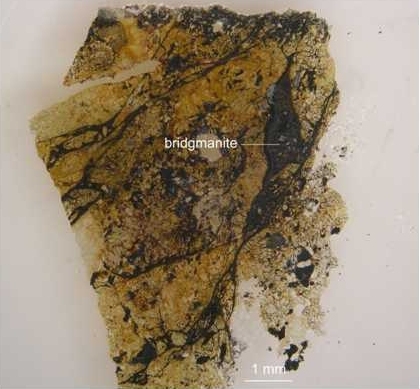 An optical image showing Tenham thin section USNM 7703 where bridgmanite was identified in a shock vein. The shock melt veins are dark brown to black over the thickness of the thin section of about 30 µm.